Lady Bellingham’s emotions when she beheld her niece on the following evening threatened for a moment or two to overcome her. She could only stare at her with horrified eyes, and open and shut her mouth in an ineffective way. Miss Grantham had come into her dressing-room to borrow her rouge-pot, and some patches. The vive bergère dress had always been arresting, for its green stripes were quite an inch broad, but until its owner had embellished it with knots of coquelicot ribbons it had been quite unexceptionable. It was amazing, thought poor Lady Bellingham, what a difference a few yards of ribbon could make! But even those shocking ribbons ribbons faded into insignificance beside the atrocity which Deborah had chosen to pin on to her elaborate coiffure. Fascinated, Lady Bellingham blinked at those three upstanding plumes, springing from a bed of gauze, and ribbon, and lace. ‘I should like,’ said Miss Grantham blandly, ‘to borrow your garnets, Aunt Lizzie, if you please.’ Lady Bellingham found her voice. ‘They are just what I need,’ said Deborah, going to the dressing-table, and opening the jewel-casket that stood on it. commentary: One of our most supportive and fashion-conscious (and knowledgeable) blogfriends is Daniel Milford Cottam – an expert in his own right, but also someone always alert to the possibilities for fun and weird finds in the world of Clothes in Books. the climax features a long scene in a casino (something I normally love). It is not at all clear what Bencolin hoped to achieve with this: the actual outcome seems unpredictable. It is ramped up as the first game of basset in 250 years: this is unique, this is extraordinary, nobody knows what basset is, it is the lost card game of the world. However those of us who mis-spent our youth reading Georgette Heyer books know all about basset and its direct descendent Faro (there’s even a regency romance called Faro’s Daughter) so it wasn’t quite so exciting for us. Faro's Daughter (which I recently re-read, and loved) has probably one of the best "Clothes in Books" scenes in all Heyer when the heroine deliberately puts together an outfit that is designed to appall and outrage in every possible way.... and it does sound quite spectacular! So obviously I couldn’t resist that, and read the book for the first time in many years. And of course Daniel was absolutely right: it is great fun. I have quoted the scene above at more than my usual length as it was so very right for the blog. Spirited young Deborah is trying to shock the awful Max Ravenscar, because they are annoyed with each other, because – oh it doesn’t really matter. As Daniel puts it, There Has Been a Terrible Misunderstanding. But the plot complications become mad even by Heyer standards: the kidnapping and subsequent scenes are absolutely splendid. 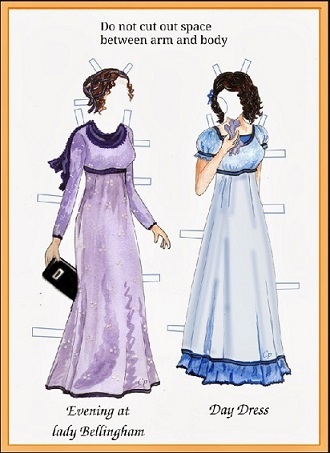 Aren’t you dying to know why Deborah’s clothes include a gown for visiting Lady Bellingham’s cellar? There is mention of an ‘E.O. Table’ early on (the first of many references) and, reading on Kindle, I wondered if it was an OCR mistake, it sounded so unfamiliar. But it is a thing: an Even-Odd table for gambling on numbers, an early form of roulette. 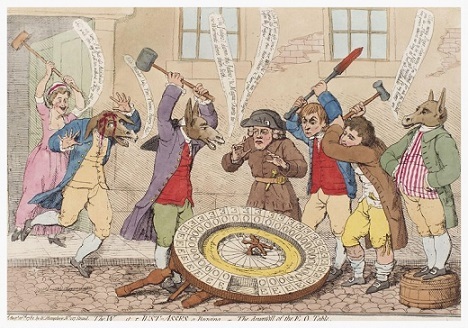 This is a James Gillray cartoon from 1792, The Downfall of the EO Table. Do you know, I saw the prettiest hat you can imagine, in a shop window in Milsom Street just now—very like yours, only with coquelicot ribbons instead of green; I quite longed for it. 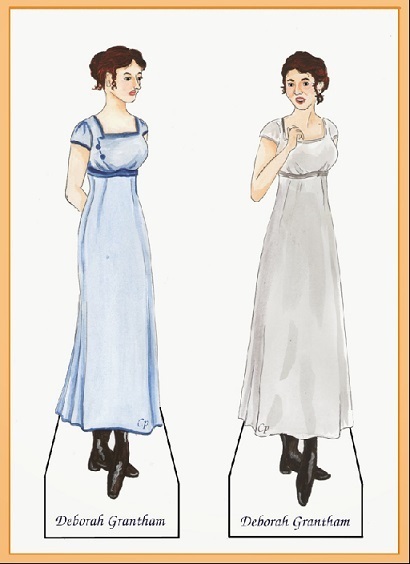 ‘Vive bergere’ is a lively shepherdess, so the gown will be a very fanciful version of what dressmakers fondly imagine such an agricultural worker might wear. Or at least the kind of bergere featured in top-end porcelain and toile de jouy patterns. Keen watchers of the recent TV adaptation of Vanity Fair (or indeed of William Makepeace Thackeray’s novel) will know that the Vauxhall Gardens was the scene for a memorable visit by Becky Sharp and friends. And that women in gaming houses featured in that story too. And I recently went to see the Puccini opera La Fanciulla del West and the game faro features there too – Minnie is another of Faro’s daughters. In Pushkin’s short story The Queen of Spades the key card game is faro, too, although it is not spelled out so much in the Thchaikovsky opera of the same name. Georgette Heyer features more on the blog for her much under-rated 1930s detective stories – I featured one two weeks ago,with a lady dressed in ostrich feathers - but there are a few more of her romances in the archive. You can find the many previous entries by clicking on the label below. And thanks again to Daniel. Love Geogette Never and appreciated your e xplanations. She never fails does she? Always entertaining. To be picky, FARO'S DAUGHTER is a Georgian romance, not a Regency (well, yes, it is a comedy of manners). If I recall correctly, the Robe Bergère is a "shepherdess" gown (word also applied to ladies' hats and a wood-framed upholstered chair). Thanks, both, for your information. It would be interesting to see a timeline of when the Heyer books are set. I guess Masqueraders and These Old Shades are earlier in the 18th C, what with Jacobite Rebellions and a French court! I do explain in the post what a bergere is, but thanks for the lovely picture. And thanks again Daniel for the reco. I do love the paper dolls. I remember enjoying them as a child. Cecilia Pekelharing's website is lovely. I will be looking for some non-mystery books by Heyer. Paper dolls were one of my favourite things when I was young, I could never get enough of them. And yes the website is gorgeous. Yes, I always think of Edwardian England as rolling blissfully on after Edward VII's death, and then ending with a bang (literally) in the middle of the summer of 1914. Thanks for sending me back to the Envious Casca posts which I seem to have missed, since I didn't comment. We can all get a bit vague on history! Glad you enjoyed Envious Casca. Great stuff to know about Georgette Heyer. 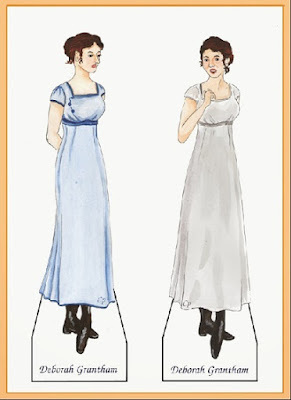 My daughter and I were talking yesterday about what a great blog this is, Moira, I'm glad to come for a visit—I think I could do a rundown of all the clothes in Heyer. Never overdone or research-stuffing, just the sort of interest that one has in the exactitude of one's own dress, and the purposes of our various clothing disguises. Thank you so much for the kind words Marina! I always wondered where Heyer did her research - fashion illos of the time? But yes: purposeful clothes descriptions, exactly what this blog is forever pursuing.